Simplify your mobile expansion and boost your productivity, wherever your work day takes you, with the HP USB-C™ Travel Hub, which delivers display and accessory connections and device charging to your HP 3-in-1, detachable or notebook with one USB-C™ cable. 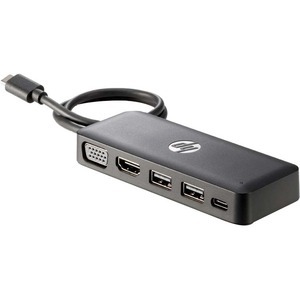 Get pass through connectivity and charging for your HP 3-in-1, detachable or notebook while you work with your device's 10W, 15W, 45W or 65W adapter. Or leave your adapter behind and power the hub from your device's USB-C™ port. Pack the compact hub in your bag alongside your mobile device and quickly connect to a fixed workspace with a display and your choice of accessories through the HDMI or VGA and USB ports.